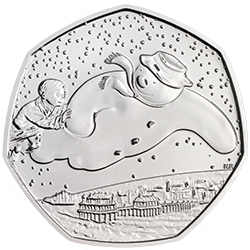 The Royal Mint has released limited edition 50p coins featuring The Snowman, illustrated by former University of Brighton teacher Raymond Briggs CBE. The issue, which includes the Royal Mint’s first coin in colour, celebrates 40 years since The Snowman’s publication. One scene captures the snowman flying over Brighton’s Palace Pier. Briggs, awarded a CBE in 2017 for services to literature, taught in the 1960s at Brighton School of Art (now the university’s School of Art). Since 1957 he has been an illustrator and writer, mainly of children’s books but also adult political satire, stage plays and radio plays, producing iconic work including The Snowman and When the Wind Blows. There are three versions of the coin – nickel, gold and silver. Only the silver coin is coloured. They have been designed by artist Natasha Ratcliffe who previously worked on the London 2012 and Paralympics Games coins.